Be Honest: Does This Recovery Make Me Look Fat? The following chart shows the natural log of MZM Own Rate (the interest rate the liquid money supply is earning). By using natural logs, exponential growth (or in this case decay) can be seen as a straight line. There is now $12.4 trillion of liquid money supply attempting to earn interest (up $716.2 billion from just a year ago). 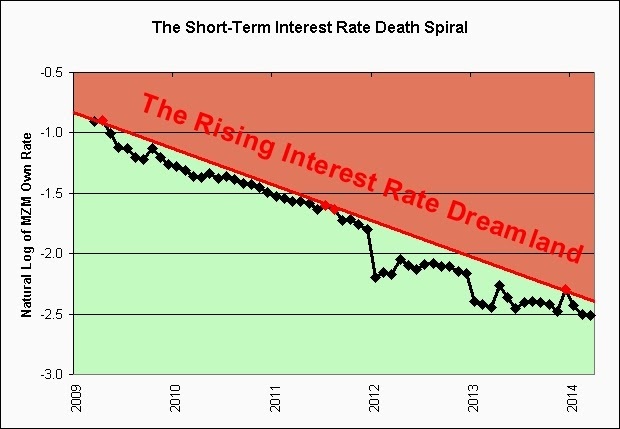 Is it any wonder that short-term interest rates are so low? As of March 2014, MZM is now earning a new record low of just 0.081% (81 cents per thousand dollars per year). Perhaps I need to do an analogy here. This is a feeble analogy by the way. Toilet paper is continually being both created and destroyed. There's always a need for more. 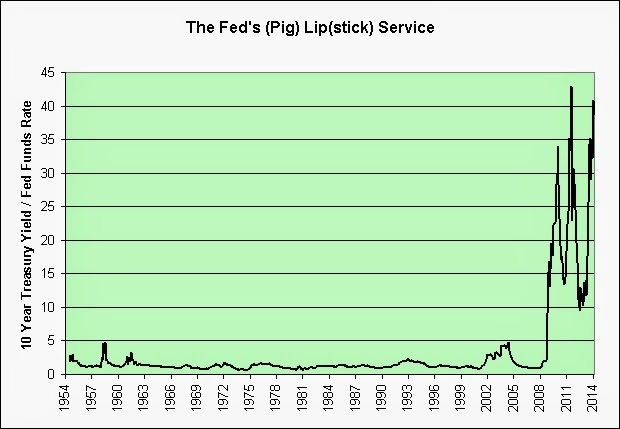 What's destroying the money supply though? It would seem that we generally make more whether we need it or not. If we can't be prosperous with $2.91 trillion earning 2.659% (annual averages in 1995) then perhaps we can be prosperous with $12.4 trillion earning just 0.081% in 2014? Is that the long-term plan more or less? 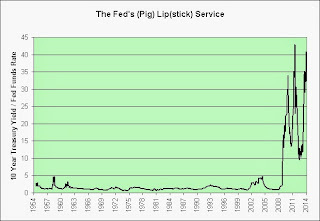 Note that the total interest paid on the total liquid money supply was nearly 8x more in 1995 than it is now. Well, you know what they almost say. It takes trillions (money) to make billions (money)! And if we keep it up long-term, then someday they might even say that it takes quadrillions to make millions! Won't that be a hoot for the savers of the future! 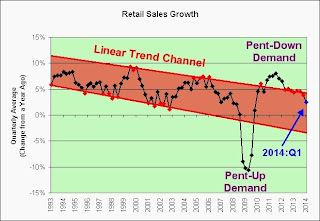 Needless to say, I'm sticking with my long-standing theory (when I turned permabearish in 2004) that it is becoming harder and harder to make money off of money. 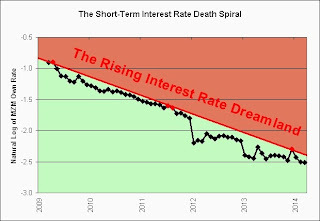 The short-term interest rate death spiral continues, not that many seem to notice. When will interest rates rise? That's what the financial "experts" keep asking. I have decidedly different questions. When will interest rates stop falling? What could cause them to stop falling? Seriously. It's like a bottomless pit of saving despair. The 1990s are so over. I was intending to post a chart today but something more pressing appeared. Our dog Honey jumped off the couch last night and landed head first right into our heavy stone coffee table. Contrary to the wishes of our dog, the table did not budge. She knocked herself so silly that she could not stand. Her eyes were swinging back and forth like a pendulum would (and her body attempted to compensate). They would not stop. As I loaded up the car with our dog, I couldn't help but think that it would be the last time I ever saw her. She was looking really dazed and confused, much like those with a serious brain injury would look. The odds of her returning home seemed very low. It didn't help that she had fluid all over the side of her face seemingly originating from her left ear (which hindsight says was just water from our other dog's water bowl kept just below the coffee table). My girlfriend drove her to the emergency vet. As I still have Shingles (don't even get me started), I was in no condition to join them (nor would anyone want me to be there spreading Chicken Pox vapors). Fortunately, our dog looks to be making a full recovery. I would never have thought it possible. I have never seen any creature look so incredibly disconnected from the real world (financial "experts" offering advice from within ivory towers notwithstanding). Honey experienced vestibular disease. Between the visit and the lab tests (to rule out brain bleed conditions), the total came to $403. It took our dog a single second to rack up such an impressive spending habit (not counting the trip to the vet or the hours spent there), but fortunately she could not keep up the pace. Life is a fragile thing, but our dog has once again persevered it would seem (knock on wood). Keep in mind that she racked up more than $12k in vet bills over the last year or so (and has made a nearly complete recovery from all of that). That makes this month rather light by comparison. D'oh! 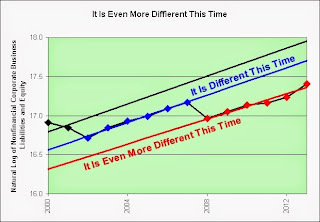 I intend on posting a chart tomorrow, should the "illusion of prosperity" gods allow it. I am certainly doing all that I can to make the necessary ritual sacrifices to appease them, lol. Sigh. In any event, I am grateful that we did not lose a pet in the last 24 hours. It was a close call. Honey is doing great today. Further, her blood work results just came in and show nothing to be worried about. Whew! Well, maybe. This particular rash of bad news of which I speak is located in a band covering the left side of my chest and back though. If you are wondering why my posting activity has been running a bit light lately then the answer is clear. I've got shingles. It would seem that I had chicken pox when I was very young and it has decided to reactivate. It's a real party let me tell you. Not! It burns, it burns. I'm not going to complain too much though. At least it hasn't gotten near my face or eyes (at least so far, knock on wood). It's a textbook case apparently. And has shingles, and caused the Nasdaq to fall 3.1% today, and so on, and so on, lol. Sigh. Gallows humor. Seriously. Sometimes you just have to laugh it off. "5 ETFs for a Relaxed Retired Life"
The product returned more than 137% over the past five years. JNK delivered strong returns of 116% over the past five years. Ah, yes! Look at the relaxing predictable performance that only stocks and junk bonds can provide! Don't let it concern you that the starting point five years ago was during the Great Recession! 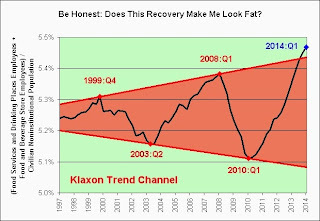 We can easily repeat this process by sliding into another Great Recession! So simply extrapolate this performance forward and know that the Fed will never allow anything bad to ever happen again! So what if VIG and VTI are down 2% since this article was written just two trading days ago (awesome timing by the way)? Relax I tell you! There's no need to panic! 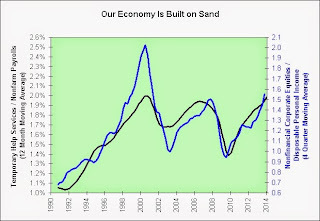 There are still ample gains to be realized for those who bought in April of 2009! Heck, the market could drop 50% from here and they'd still have gains! See? No point worrying! And whatever you do, don't let my excessive use of exclamation points get to you! That's just me trying to inspire extra confidence in these trying times!! Please take a deep breath, lean back in that La-Z-Boy recliner recently purchased on what's left of revolving credit growth, and relax to the smooth, calming sounds of Dream Theater! Crank it up to the point you cannot hear the screams of Jim Cramer on Mad Money! Drown it out! That's what I say!! 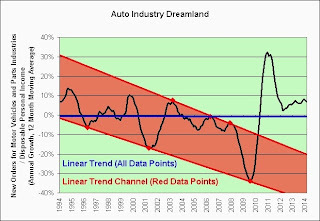 The following chart shows the "rising interest rate" environment as seen through the eyes of commercial banks offering 48 month new auto loans. 1. 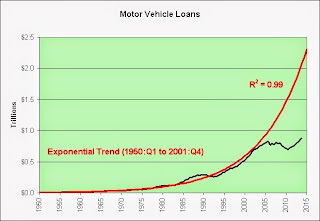 Note that auto loans appear to be immune. 2. Check out that Motor Trend (we're right on it). 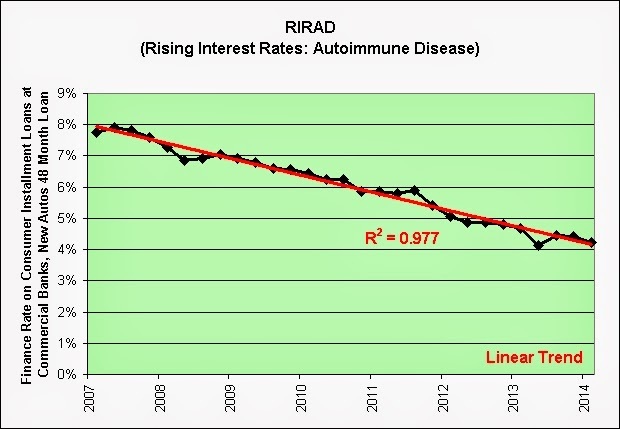 The treatment of autoimmune diseases is typically with immunosuppression—medication that decreases the immune response. 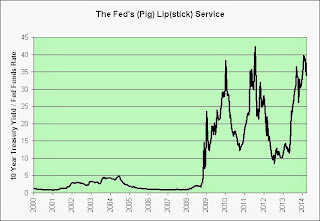 Alternatively, the Fed can just keep giving this economy more crack cocaine. Tough call. Crack cocaine is a substance that affects the brain chemistry of the user: causing euphoria, supreme confidence, loss of appetite, insomnia, alertness, increased energy, a craving for more cocaine, and potential paranoia (ending after use). As the 10 year treasury yield doubled (black, left scale), the Fed Funds rate was cut in half (blue, right scale). It would seem that the Federal Reserve Board doesn't have much confidence in rising interest rate theories (based on what they do compared to what they say). 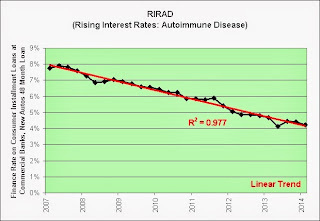 The following chart shows the ratio between the two rates. It might not seem like it for long-term savers in despair (or stock market investors still swinging for the fences at any price), but the 10 year treasury yielding roughly 40x the Fed Funds rate is a very rare treat. In the grand scheme of things, it just doesn't come around very often. 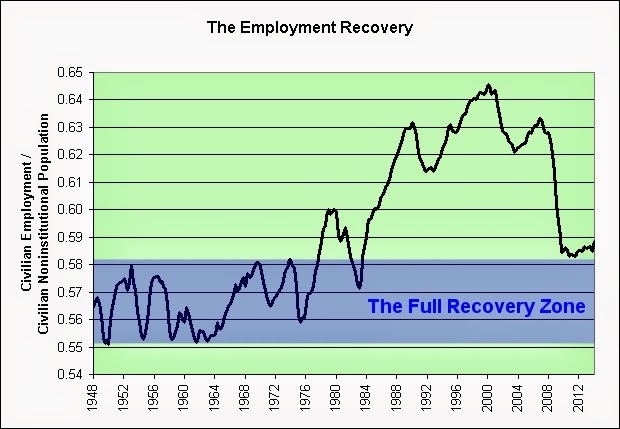 That's especially true nearly 5 years into a strong and resilient "recovery". 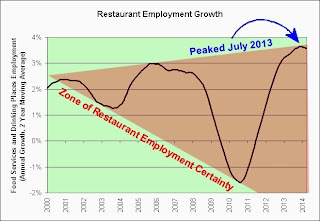 The following chart shows the 2 year moving average of the annual growth in the number of food service and drinking places employees. For those considering opening a new restaurant, there were probably better times in all of recorded history to do so. The dashed line assumes that this ratio stayed constant since January 2008 - and seems to suggest that there should be 7.2 million more private sector jobs today. This is nonsense. This ignores the decline in the participation rate due to demographics. 1. 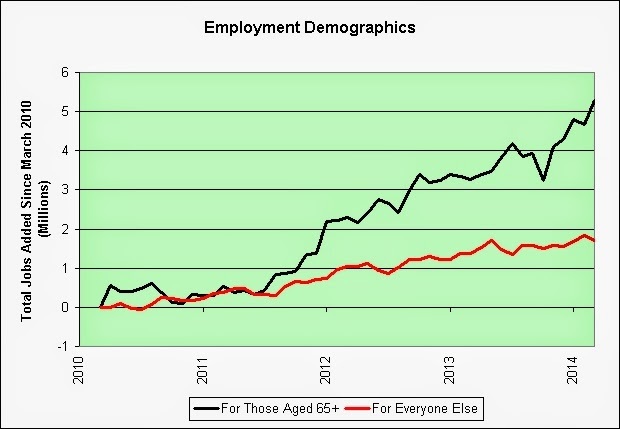 As seen in the black line, the economy has added a whopping 5.3 million jobs for those aged 65 years and older. Keep in mind that many of the jobs "added" are simply due to people reaching age 65 and continuing to work. But still, it is a staggering number. 2. As seen in the red line, the economy has added a mere 1.7 million jobs for everyone else. It's not quite as bad as it looks though. Each person aged 64 who turns 65 but continues to work, basically destroys a potential job for this group (which needs to be offset by jobs added elsewhere). But still, it is a meager number of jobs added just the same. Each region may have a different range of ages, but typically the ages of 20 to 65 are used. Somebody better point this definition out to those 65 years and older, for they have become our economy's employment growth engine. This poses a serious problem for those coming out of college saddled with heavy student loan debt. To sum this up, I most certainly do not see the "nonsense" that Calculated Risk sees. There are currently 19.6 million total unemployed plus all marginally attached workers plus total employed part time for economic reasons. Does 7.2 million really seem so far out of line when seen in this context? We could debate the particulars no doubt, but my closing argument would be, "Nonsense my @$$!" 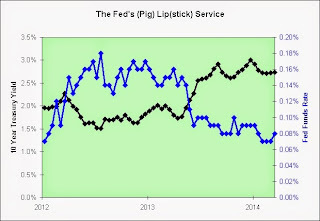 Perhaps the future's so bright some gotta apply shades of rose-colored lipstick to this economy's pig? As you can probably guess, it certainly won't be me. 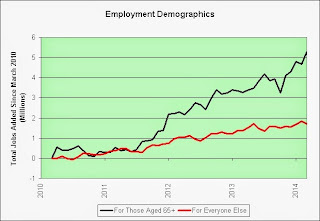 The following chart shows civilian employment divided by the civilian noninstitutional population. For what it is worth, I'm confident that we will make a "full recovery" during the next recession. It was one helluva party though. Wasn't it? The following chart shows the quarterly average of the number of employees at food services and drinking places plus the number of employees at food and beverage stores all divided by the civilian noninstitutional population. Who needs labor market stability? Behold the blog's first klaxon trend channel failure! It's nothing but upside surprises from here no doubt. This is fantastic news for those who believed that we could actually eat our way back to prosperity yet again! Mission f@#$ing accomplished! Woohoo! The black line shows the 12 month moving average of temporary help services employment divided by nonfarm payrolls (left scale). The blue line shows the 4 quarter moving average of nonfinancial corporate equities divided by disposable personal income (right scale). The following chart shows the 12 month moving average of the annual percentage change in new orders for motor vehicles and parts industries divided by disposable personal income. 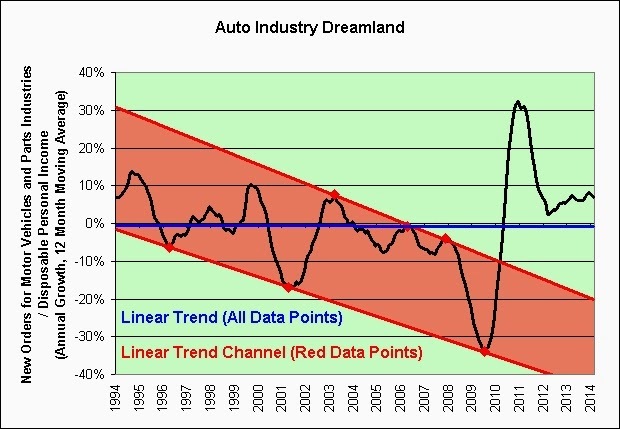 Dreamland case: Growth accelerates to the upside from here. Best case: We return to the blue trend line. Worst case: We continue on to the red trend channel. Underwriting standards began to decline amid five years of Federal Reserve stimulus that set off a race for higher-yielding assets, spurring a surge in issuance of bonds tied to subprime auto loans. This is your captain. Please fasten your seat belts and brace for impact again. The following chart compares the annual change in the consumer price index less food and energy (in blue) to the Fed Funds rate (in black). 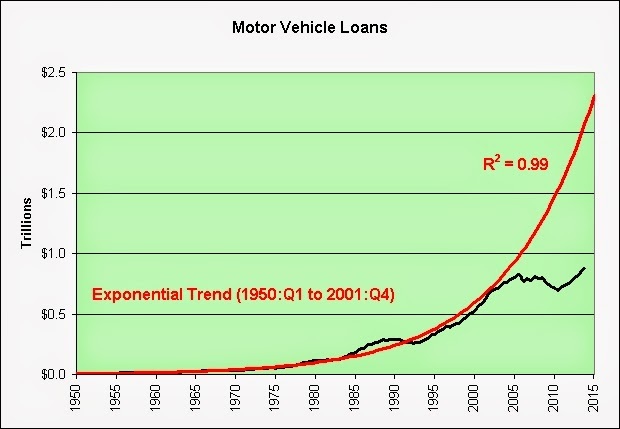 Yellen: What's wrong with this crazy car? Plosser: Nothing is wrong. Just give it a bit more gas. Yellen: Um, I tried. Why can't we speed up? Plosser: I don't know. I've got the accelerator right in my hand. 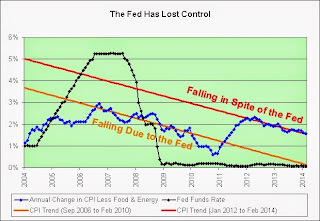 Yellen: Why isn't it on the floor below my feet? 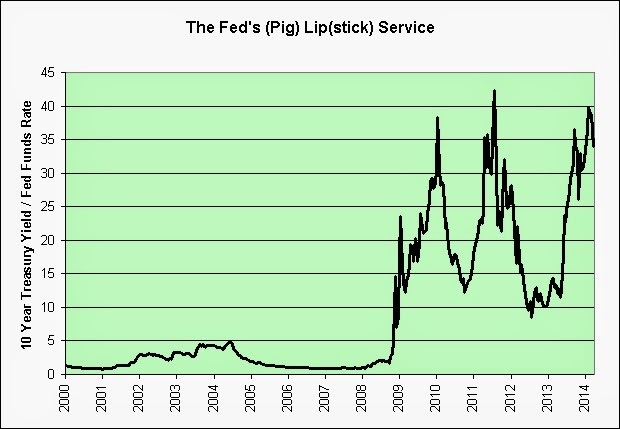 Plosser: Bernanke broke it clean off. Yellen: Can't you just weld it back into place? Plosser: Hey! You're the welder! Don't look at me! 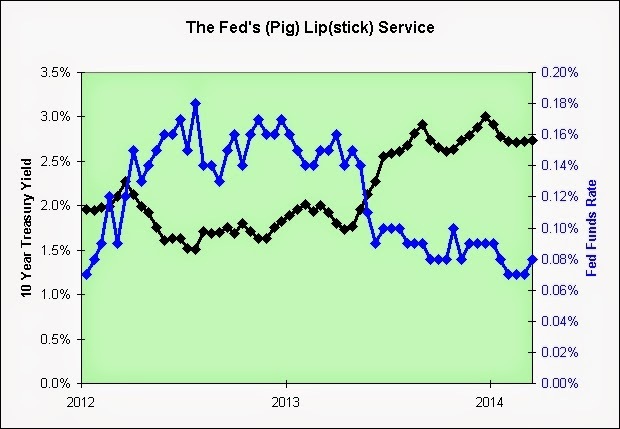 Yellen: This is not good! Plosser: OMG! Watch out for the pedestrian in the crosswalk! Yellen: I'm swerving into the abandoned shopping mall! Hold on! Plosser: For the love of all that's holy, hit the horn! Nonfinancial corporate liabilities and equities have reached a staggering $36.3 trillion and it is my contention that the growth rate cannot continue as it has in the past. I offer the following evidence to support my claim. The following chart shows the natural log of nonfinancial corporate liabilities and equities. I'm using a natural log so that constant exponential growth can be seen as a straight line. From 1960 to 2001, the growth did not concern itself with inflation, interest rates, labor markets, wars, and so on. Barring several temporary short-term hiccups, it simply continued higher at a relatively constant pace regardless of economic conditions. The dotcom bust then appeared. As seen in blue, it was different this time. 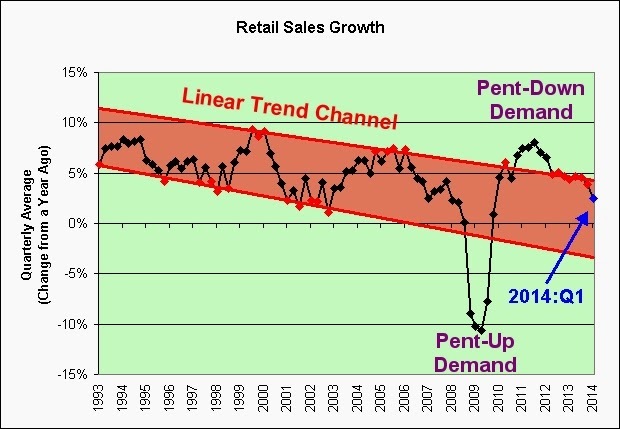 The exponential trend failed and there was no recovery back to the original trend in black. What was lost, was permanently lost. The housing bust came next. As seen in red, it was even more different this time. 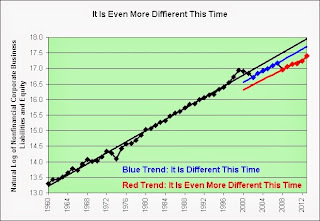 The trend failed and once again there was no recovery back to the original trend (either black or blue). What was lost, was permanently lost. 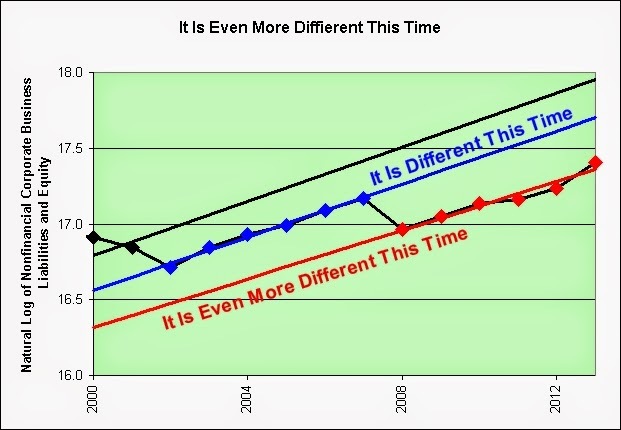 I believe this trend will ultimately fail again and that what will be lost, will be permanently lost yet again. 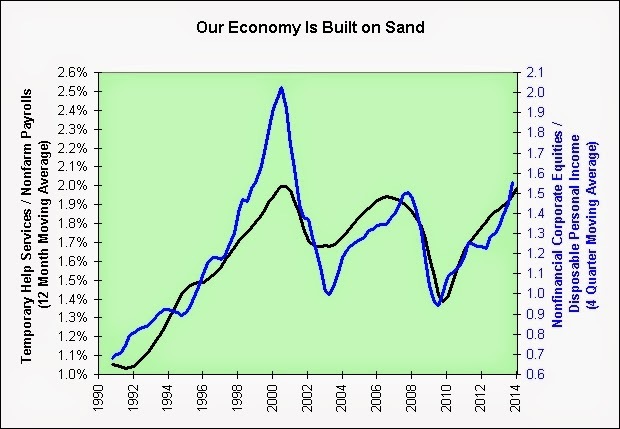 Those bullish on our economy over the long-term will ignore this dire prediction of course. They'll no doubt continue to point to the record cash sitting on corporate balance sheets, while conveniently ignoring the record liabilities that go with it. It is April Fools' Day of course.